For all, snowmobiling is a way of life. But for some, that way of life is dependent on a machine built to work. The VK540 is engineered to be tough, with all the dependable workhorse features you would need to complete any winter work. 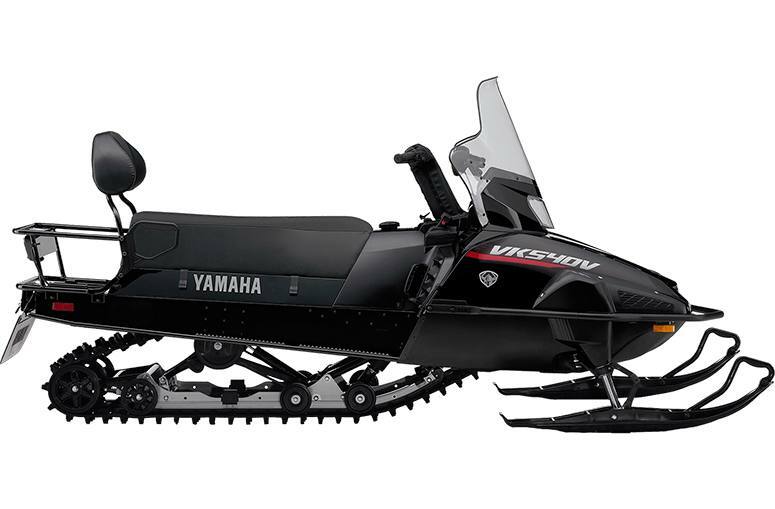 Tested in Yamaha's engineered wind tunnel to develop a body and windshield that would hold up against the harsh polar conditions, inside and out the VK540 is ready and waiting to work. Three Speed Transmission: The Hi/Lo transmission with reverse is workhorse one minute, and a versatile trail cruiser the next. With a simple to use manual actuated lever, you can select from ?normal? high range for cruising to low range and pull heavy loads. Camoplast 1.5 Cobra Wide Track: The primary purpose of the 20" x 154" x 1.5" Cobra track is to fully maximize all available snow with confidence-inspiring deep snow floatation and powerful pulling force. The 1.5" lug is perfect for low-speed or high-load situations that utility sleds often function in. NEW Tunnel Design: The new tunnel design includes large snow evacuation holes on running boards with traction. The tunnel is built out of lightweight, high-tensile steel to keep the VK540's legendary rugged durability in the toughest conditions. Protective Windshield: A wide, tall, wrap-around style windshield delivers greater protection from the elements as well as unsuspecting tree branches and limbs. The windshield has been wind tunnel tested to reduce unwanted negative swirl and deliver a greater ?pocket? of comfort for both driver and passenger. Standard Electric Start: Seamless and easy to use electric start delivers instant and hassle free starts, no matter the weather, eliminating the need for an ?old-school? pull rope. Expansive Under-Seat Storage: With a hinged, flip-up seat, the VK Professional II exudes its work ethic at every turn. The large under-seat storage touts an integrated tool kit and room for much more. Simplicity: While other plans bog you down in the details, factory-backed YPP gives you bulletproof protection from the unexpected. And it's as simple to use and understand as your Yamaha factory warranty. Protection From Expensive Bills: YPP is there whether your repair is a few dollars or a few thousand. No Deductible to Pay - Ever: Under YPP, Yamaha picks up the entire cost to repair every applicable manufacturing defect. Pick up Where Your Factory Warranty Leaves Off: YPP takes over automatically - and immediately - when your factory warranty expires. Added Value for Your Yamaha: Your YPP warranty is transferable, increasing the value of your Yamaha if you decide to sell or trade. No Claim Forms: Since we already know your Yamaha, there's no need for you to fill out lengthy claim forms. Your YPP information is available at every authorized Yamaha dealer across Canada. Affordable Options: Purchase years of YPP coverage at a fraction of what a single major repair costs. You can also use the Yamaha Financial Services program to finance this coverage. Real Peace of Mind: Yamaha is ready to step in to make necessary repairs (excluding those due to normal wear or aging) using genuine Yamaha parts and factory authorized technicians for the full duration of your coverage.